Tape Hair Extensions. 20pce per pack. 2.5g per piece. Virgin Cuticle Human Hair. Strong Durable Blue Tape. Double Drawn, thick ends. Pieces per pack: 20 with tape already attached. All our Tape Hair is now made from the highest quality Euro Virgin Cuticle Remy Hair. Euro Cuticle Hair is processed differently from regular Remy human hair. It is processed using a cold method, over a longer time, which is less damaging than the older way of processing using heat and acid. It is the highest quality on the market. Tape Hair Extensions are quick and easy to apply. A full head can be applied in under 30 mins. 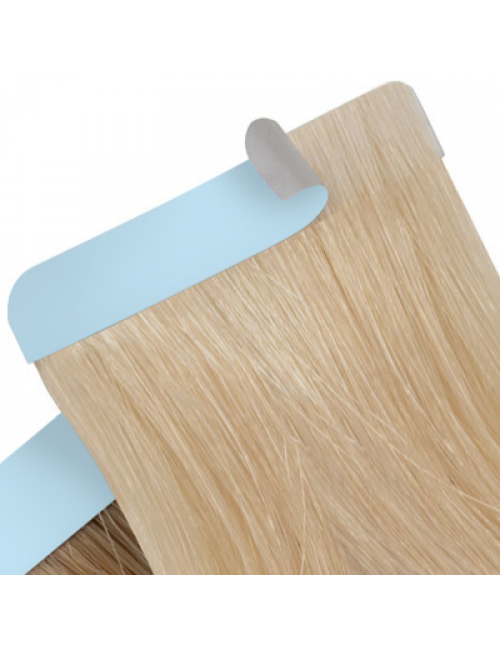 Each piece has blue double sided tape already pre-attached so it is ready to apply straight to your hair. Tape size is approx 4cm wide x 1 cm wide. Once the blue paper is removed the tape itself is clear. Cleopatra Tape Hair has strong durable blue tape will last between 4-8 weeks before having to be replaced. Blue Tape is the strongest tape on the market. Quick and easy to apply. Your hair is simply sandwiched between two pieces of the tape hair extensions. Each pack contains 20 pieces (10 pairs once placed on top of one another). One pack is enough for highlights. If you want a full head of hair extensions you will need to purchase two or more packs depending on the length/thickness of your own hairr and the look that you are wanting to achieve. 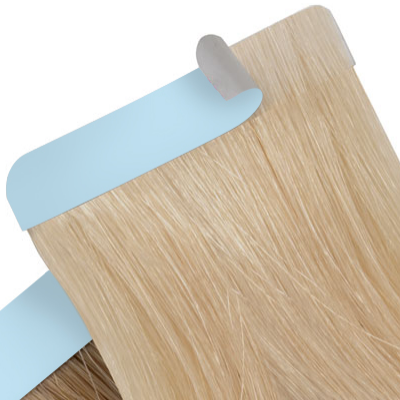 All of our Tape Hair Extensions are made from 100% silky soft Virgin Remy Cuticle Human Hair. Remy means that all the cuticles on the hair are running in the same direction, just like your natural hair grows. This means less tangling, and longer lasting hair. Our newest White Blonde #1001 is slightly more expensive than our other colours due to the extra special processing involved in creating this colour. Three Packs (60 pieces) - For medium/thick hair - our most popular choice. Four Packs (80 pieces) - For the ultimate in thickness, or for those with shorter hair. Our Tape Hair Extensions can be treated just like your own hair. You can wash them, cut them, blow dry them, style them, and even straighten and curl them just like you would with your own hair. Please be advised though that we always recommend using a heat protectant when using straighteners and curling irons on your hair extensions. 1. Firstly wash your hair with a Clarifying shampoo to remove product buildup. Do not condition your hair. Dry hair naturally or with hair dryer. 2. Place a thin layer of your own hair between two Tape Extension wefts and squeeze firmly. You can also use a hair straightener and hold for a few seconds to ensure the glue bonds together. 3. Wait 24-48 hours before washing your hair so that the bonds have enough time to set properly. 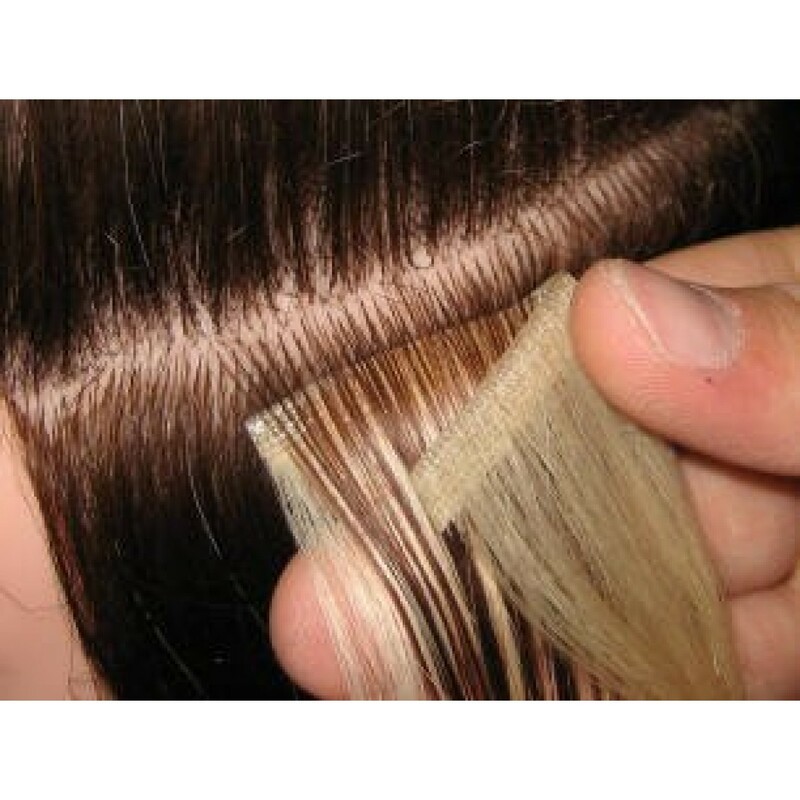 Tape Hair is removed by using a Solvent especially designed for removing tape hair extensions. This can be purchased in our store. If you would like more detailed instructions these can be found under the Information Tab in our How To Guides.